Navarathri (நவராத்திரி) has started this year and as always festival time brings back memories. Navarathri is the Hindu festival devoted to the worship Goddess ‘Sakthi’ who is believed to remain in three different forms through these nine days – Durga (துர்கா-Goddess of victory), Lakshmi (லக்ஷ்மி-Goddess of wealth) and Saraswathi (சரஸ்வதி-Goddess of knowledge). According to mythology, the Goddess waged a war with evil ‘Mahishasura’(மகிஷாசுரன்) and killed him. This devine triumph over evil is celebrated as ‘Navarathri’ or Dussera (தசரா). In Tamil Brahmin homes, dolls of God and Goddesses are arranged in the form of ‘Kolu’ (கொலு) and the Goddess is worshiped for nine days ending with ‘Vijayadhasami’(விஜயதசமி). Everyday, offerings made to Goddess are distributed to the visitors. ‘Sundal’ (சுண்டல்) has a special place among these offerings. Sundal is nothing but seasoned lentils or pulses that are made either sweet or spicy. Let us see how to make different types of sundal through this dussera. Method: Wash Bengal gram dhal and pressure cook with salt and ½ tumbler (100ml) of water for 5 minutes or 5 whistles. 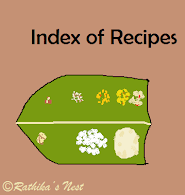 You may cook such a small quantity of dhal along with rice. Once the pressure subsides, remove the dhal from the cooker. Drain excess water and keep aside. Heat oil in a kadai, add red chillies and fry till they turn darker. Add mustard seeds and when they start to sputter, add urad dhal. Fry till the dhal turns golden brown. Now add the cooked dhal, asafoetida and coconut gratings. Sauté for a minute and garnish with curry leaves. Serve hot.